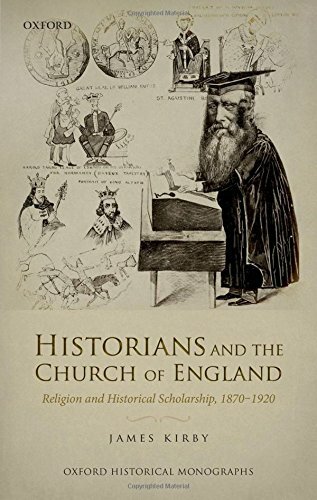 Historians and the Church of England explores the vital relationship between the Church of England and the development of historical scholarship in the Victorian and Edwardian era. It draws upon a wide range of sources, from canonical works of history to unpublished letters, from sermons to periodical articles, to give a clear picture of the influence of religion upon the rich and flourishing world of English historical scholarship. The result is a radically revised understanding of both historiography and the Church of England. It shows that the main historiographical topics at the time-the nation, the constitution, the Reformation, and (increasingly) socio-economic history-were all imprinted with the distinctively Anglican concerns of leading historians. It brings to life the ideas of time, progress, and divine providence which structured their understanding of the past. It also shows that the Church of England remained a 'learned church', concerned not just with narrowly religious functions but also scholarly and cultural ones, into the early twentieth century: intellectual secularization was a slower and more fragmented process than accounts focused on natural science (especially Darwinism) to the exclusion of the humanities have led us to believe. This is not just the history of a coterie of scholars, but also of a wealth of texts and ideas that had a truly global circulation at a time when history was second only to the Bible (and perhaps the novel) in its cultural status and readership.